Ropa Vieja - you're not really eating "Old Clothes"! 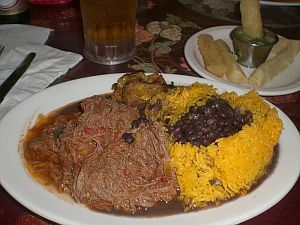 Ropa Vieja is generally thought to be a Cuban dish, but there is a distinct Canarian connection. If you check out my Tenerife history page, you'll see that, as a result of the Spanish Civil War, many Canarians fled the archipelago across the Atlantic, settling in Cuba or South America. So, this intriguing dish is as much Canarian as anywhere else. Even if its name means "old clothes", you can be assured that it doesn't taste like them! A legend exists to explain the name. It is said that there was a man who was expecting his family for dinner, but he had no food in the house and was too poor to go out and buy some. In desperation, he went and took some of his clothes, tore them into shreds and cooked them! Such was the love he had for his family, it became imbued in the clothes and turned them into a delicious stew. All very touching, but still just a legend. The real reason is probably because the meat used in the dish is shredded, making it look like old, tattered clothes. Ropa Vieja is, in fact, a hearty beef stew in which the meat has been cooked twice - first boiled to make it tender, then cooked again in oil. Some Canarian versions can also use chicken or pork or any combination of the three meats. It is best served with rice or crusty bread to soak up the sauce. Cut one of the onions into quarters, chop the carrot and celery and smash one of the cloves of garlic. Place all of these vegetables into a large saucepan, along with the steak, the bay leaf and a pinch of salt. Add water to cover by two inches. Bring to the boil, then allow to simmer for between 1½ to 2 hours, skimming the liquid frequently. The aim is to get the meat really tender. When this is done, remove the meat and allow to cool. Strain the liquid through a sieve, discarding the vegetables. Return the liquid to the heat and boil for a further 20-30 minutes, so that it reduces by about a half. During this time, coarsely chop the second onion, deseed and chop the tomatoes, cut the peppers into strips and finely chop the second garlic clove and the chillis. When the steak is cooled, shred it into strips, either by hand or using a couple of forks. Heat the oil in a pan, then cook the onion, peppers, garlic and chillis until softened. Stir in 1½ cups of the reduced liquid from Part One, plus the sherry, the tomatoes and add the second bay leaf, the cumin and a pinch of salt. Cook a further 15-20 minutes. Finally, after removing the bay leaf, add the shredded meat, oregano and parsley, cooking another 10-15 minutes, until the meat is heated through. Despite its name, Ropa Vieja isn't half bad! Why not give it a try?